Most people generally know what it means when a dog growls. When you hear a dog growling, it can be very frightening. That's because growling is often the first sign of aggression seen from a dog. 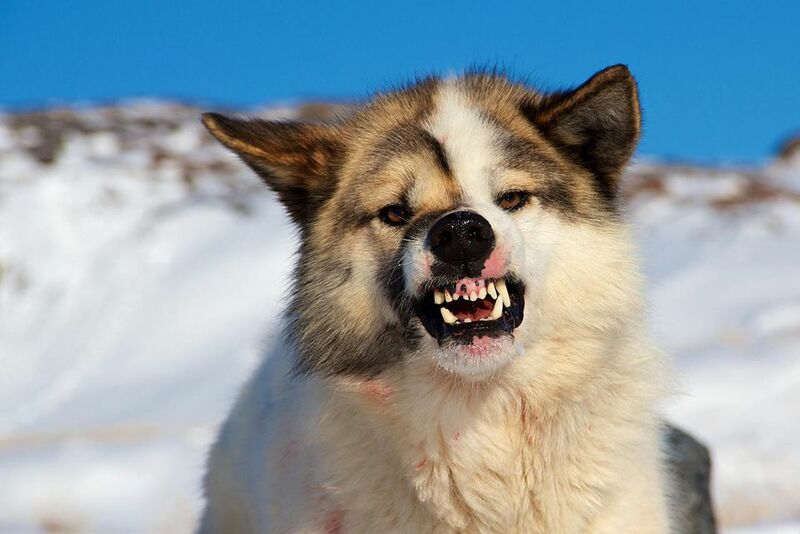 It is a warning that a dog might bite, so it's important to be very careful near a growling dog. For this reason, it's important to understand why your dog is growling so you can figure out the degree of aggression and the best way to deal with the problem. Dog growling is a form of communication. Your dog is not able to tell you when he's unhappy or uncomfortable with words. Most dogs will first use their body language to communicate with you. If you are unable to pick up on the more subtle clues, he may growl to let you know how he feels. The most common reasons dogs growl are fear, possession aggression, territoriality, and pain. Some dogs also growl when playing. Play growling is often seen when two dogs are having a safe, healthy play session. In this case, the growling does not necessarily indicate aggression. However, it is still important to watch your dog's body language and make sure play growling doesn't lead to a dogfight. You may also notice play growling when you play tug-of-war with your dog. Gentle growling is not a bad sign unless your dog is escalating and showing other signs of aggression. If your dog nips at your hand, lunges at you, or the growling gets very threatening, it's important to end the game. Fear: Dogs often growl when they are afraid. A good example of this can be seen with dogs who are afraid of strangers. When a stranger approaches, a fearful dog may growl. This is his way of saying, "Back off." Possession Aggression: Some dogs growl over their possessions, such as a bowl of food, a toy, a rawhide bone. When a dog growls when someone approaches him while he's eating or chewing a bone, it is his way of saying, "This is mine, and I'm not sharing!" Territoriality: Sometimes dogs growl when they feel the need to defend their territory - think of the mailman approaching the door. When the dog sees someone who he believes doesn't belong on the property, he wants to let them know that they're overstepping their boundaries. Dog growling in this instance means, "Hey, you don't belong here, and I'm willing to protect my people and property!" Pain: Dog growling may also occur due to the pain of an injury or illness. There is usually a combination of things going on here. First, there is the unexplained pain going on in their bodies. Very often this is followed by veterinarians poking and prodding. This means on top of the pain, dogs are experiencing a great deal of confusion. The dog may associate the people trying to help him with the pain and fear. Dog growling in this instance usually means, "I'm in pain and afraid, and you need to stop hurting me." If you understand what a dog's growl means, you may be able to better deal with the growling dog. However, do not put yourself in harm's way, especially if the dog is not your own. You may decide to consult a dog trainer or behaviorist if your dog's growling turns to snapping or biting.